Replacing your roof may sound like a complicated ordeal, but it doesn’t have to be. Not with Axe Roofing on your side. When you need a new roof, we’re the roofing company you want, as we make replacing your roof simple. 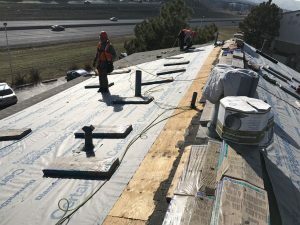 We provide steep-slope and low-slope roof replacements and repairs for residential, commercial, and multi-family structures in Denver, Colorado and the surrounding communities. We have a team of highly trained and experienced roofing contractors that is dedicated to delivering exceptional service and results, as our A+ rating with the Better Business Bureau proves. As a locally owned and operated roofing company, our reputation is extremely important to us, as we’re local residents ourselves. We do what we say we’re going to do, when we say we’re going to do it – every time. Our quotes are honest, our installers are punctual, and we do the work the way it needs to be done to provide you with the best roof system possible. With Axe Roofing, there are no gimmicks – just honesty and integrity. That’s because we value building strong relationships with our customers, who are also our neighbors. And as a good neighbor, we go above and beyond when needed. This includes providing assistance in navigating insurance claims that result from storm damage. 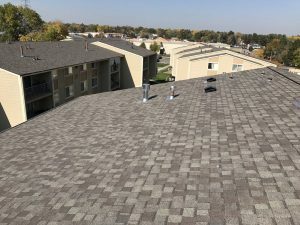 We fully understand the complications that the extreme weather in the Denver area, such as the frequent hail storms that can cause heavy damage in an instant, can pose to a structure’s roof. We’re the roofing company you can count on when storm damage occurs. We facilitate the entire claim, including providing the initial inspection and working with the insurance adjuster to make sure all necessary repairs are outlined and covered. We strive to make the process easy for you, and you can trust that we’ll ensure everything is properly addressed so that you end up with a dependable new roof. Having repaired and installed roofs for residential, commercial, and multi-family structures, we, at Axe Roofing, know there is a potential to meet a vast range of different needs. That is why we offer multiple types of roofing systems. Whether you need a repair or replacement on a shingle roof, tile/slate roof, synthetic tile roof, standing seam metal roof, or EPDM or TPO flat roof, you can trust that we’re using materials that will provide long-lasting protection. 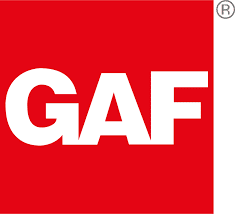 We only offer roof systems manufactured by industry leaders, such as Owens Corning®, CertainTeed, and GAF®, to name a few. Furthermore, you can trust that when we’re completing your roof installation, we’ll do everything necessary to ensure the integrity of your new roof. In fact, with every roofing system we install, we add five no-cost upgrades just because we want make sure your roof is the best it can be once we’re done with it. 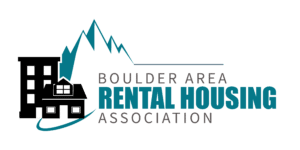 Don’t waste any more time researching roofing contractors in the Denver area. Contact Axe Roofing today to hire a roofing company that you can depend on to go above and beyond for your project. Our team will be happy to schedule a free consultation and provide an inspection and no-obligation quote for your project. Financing is available to those who qualify.